St. Ninian's church, formerly a convent, lies in substantial grounds at 21 Culduthel Road, Inverness. 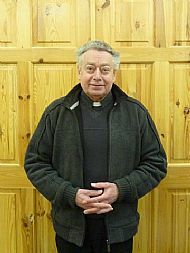 The parish priest is Father John Allen. The story of the church and its development during the last 25 years, is told in detail in a booklet "The History of St. Ninian's". It is summarised here and a brief synopsis of St. Ninian himself is told here. Our parishioners are kept up-to-date with events in the parish by our Newsletter which is printed weekly. The varying sections of the Newsletter can be seen at "Daily Services", at "This week's news", at "Follow-up prayer" and at "Groups and Societies" so, if you misplace your paper copy, you will find the information on this site. We also have a selection of links to other sites that may be of interest.